At The Family Pet Hospital Laser and Wellness Center, we understand that the bond you and your beloved feline friend share is invaluable and irreplaceable. We also understand that by nature, cats are roaming creatures and therefore run the risk of wandering too far from home, or just accidentally losing their way. In fact, a staggering number of cats are lost in the shelter system each year because they lack any means to identify them with. This is why we are happy to offer cat microchip identification services. An RFID chip itself is useless if your registration isn't submitted and then kept current with adress changes as you move, etc. That is why all microchips that we place will be automatically registered and this registration is included in the cost of the procedure. This registration lasts for the life of the animal. You may be contacted annually by the manufacturer of the chip to see if you want to renew their retrieval service. Basically, if your pet is lost and you contact them, they will help you with posters, contacting animal control officers and hospitals in the area, etc. Some also offer mini insurance services in case that the pet is found, someone calls and identifies that it is an owned pet but you happen to be on vacation and cannot be reached that will allow the hospital to start primary needed care until you are found. It is best to call the company when you get your renewal notice and find out exactly what it is that you are renewing for and make a decission based on that on an annual basis. It is not necessary to renew as your pet will still be able to be found in their registry from the moment of the initial registration onward. 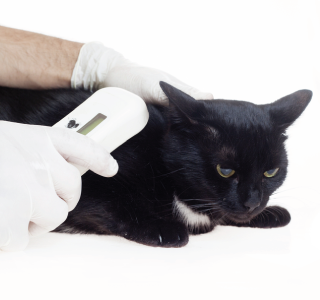 Don't hesitate to ask your veterinarian any questions about the registration process, in order to ensure your beloved feline friend can be accurately identified with his or her pet microchip.